How To Buy The Best Integrated Washing Machine - Which? An integrated washing machine is ideal for those of you wanting to streamline your kitchen design and keep your appliances hidden from view. But with different types and sizes of built-in washing machines available, all at different price points, it can be tricky to choose which product is most suited to you and your home. Our handy integrated washing machine buying guide will explain everything from how to install your washing machine to the cost of buying your built-in appliance, so you're not left disappointed with your choice. If you already know what you’re looking for, head straight to our integrated washing machine reviews. Should I choose an integrated washing machine? What is the standard size of an integrated washing machine? How much does it cost to fit an integrated washing machine? Will I have a limited choice if I want an integrated washing machine? How much will an integrated washing machine cost? Are integrated machines better than freestanding machines? How noisy is an integrated machine? Is it easy to maintain my integrated washing machine? Can I replace my integrated washing machine? Integrated washing machines are designed to be incorporated into your kitchen units, sitting underneath your worktop and typically behind a door. You might have also heard the terms built-in, built-under, semi-integrated and fully integrated. 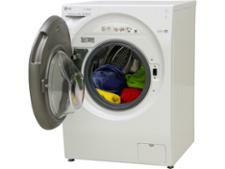 Fully integrated washing machines, also known as built in, are the most common type. They sit within your kitchen unit and are completely concealed by a door (see below). They're perfect for anyone who doesn't like their appliance to be on show. Fully integrated washing machines have a flat front door with space to attach the hinges of your kitchen cupboard door. The plinth at the bottom of the machine will be recessed – this is so the wooden plinth at the bottom of your kitchen unit can run across it. 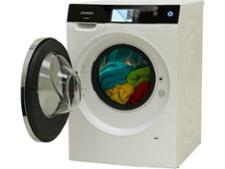 Fully integrated washing machines are designed specifically for use within a kitchen unit. Therefore it’s not wise to leave one of these machines freestanding as the machine then won’t have the correct support or stability. A semi-integrated washing machine will also sit within a kitchen unit and behind a door, but the control panel will be on show (see below) – this is the only difference to a fully-integrated model. These machines are a lot less common, but are great if you like to check how long is left on your wash cycle. Some manufacturers have found a way around this, though. Bosch and Siemens have a selection of fully integrated models that shine the remaining wash time on to the floor. If you want a washing machine that simply sits under a worktop in between your units, then it is not an integrated washing machine. You want a freestanding washing machine. Watch out for confusion if you're searching online where some websites refer to these 'built under' types of washing machines as 'built in' which they're not. If you’re not sure integrated machines will work for you, our washing machine buying guide explains the other types available. 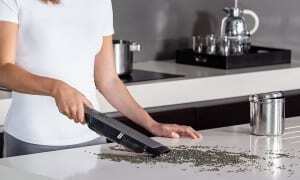 It will be flush to your units, so your machine won’t protrude into the galley or surrounding space in your kitchen. Integrated models can be more expensive to buy, install, maintain and replace. Most front-loading washing machines – integrated and freestanding – follow the standard dimensions of 85cm high, and 59.5cm to 60cm wide. And the good news is that the majority of kitchen cabinets are designed with the standard height and width to be able to accommodate integrated appliances comfortably. However, it’s the depth that can really catch people out. Ranging from 40-65cm deep, integrated machines can vary. And not measuring before buying might mean you're left with a hefty appliance sticking further out than your cupboards. You should also note drum capacity is different to size. Just because you have a large machine in dimensions doesn’t mean it has a large drum capacity. Integrated washing machines can come with 5kg, 6kg, 7kg, 8kg and sometimes 9kg drums. Most integrated models only go up to a drum size of 9kg - this is around 13 towels per cycle. Not sure what machine you could squeeze into your kitchen? Check the average depth measurements for each drum size. If you’re replacing an old integrated model then measure that instead of squeezing into the cabinet yourself. Using a tape measure, check the height and width of the existing machine. Now measure the front to the back of the appliance for the depth. But be sure to add around 7cm at the back for any pipes and hoses that will sit behind. You don’t need to worry about the controls and dials sticking out like some freestanding models. Integrated should have a flat front design, plus space to fit the door hinges. Designing your kitchen from scratch? You’ll be able to find the dimensions of your washing machine on the specifications. Not clued up when it comes to washing machine jargon? From elbows to anchor bolts, our guide explains all the terms you need to know. Unfortunately, installing an integrated washing machine is harder than installing a freestanding model – mostly because you have to attach the surrounding cupboards, and remove and replace the kitchen unit plinth. But if you're a keen DIY’er you might fancy giving it a go. 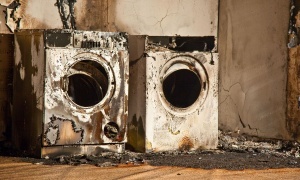 Our guide to installing your washing machine will help you disconnect your old appliance and reconnect the new one. Once that’s completed, your instruction manual should explain how to fit the cupboard door to the machine and reset the plinth. Brands will have similar installation methods. Although there could be some helpful functions that differ with each model, such as the new adjustable front feet in some Bosch integrated washing machines. Set on tackling installation yourself? Make sure you carefully read the instructions – warranties will not cover incorrect installation. For those of you who prefer to steer clear of the toolbox – get a trader in. A professional will charge more to install a integrated or built-in appliance because of the extra work involved, but for more complex jobs it can be worthwhile. Argos charges £100 to disconnect and recycle your old integrated machine and then install your new one. But it only charges £45 to recycle and install a freestanding model. Currys PC World and John Lewis charge £90 for integrated appliance installations, and £15 to remove and dispose of your old appliance. In comparison, John Lewis charges just £25 to install a freestanding model. Again, AO asks for £90 to install the new washing machine and £20 to remove the old one, but charge just £25 to fit your new freestanding model. (Prices checked in August 2018). If you’re looking for a recommended tradesperson you can trust, visit Which? Trusted Traders to find someone that’s been through our rigorous checks. In short, yes. Because less people want or can have an integrated washing machine in their home there are fewer options in stores. Because of the smaller market, we have six times as few reviews for integrated washing machines than we do for freestanding washing machines. This doesn’t mean you can’t get a great washing machine, though. We have plenty of Best Buy integrated models from big name brands such as Beko, Bosch and Siemens. Integrated models tend to cost more than their freestanding counterparts. This is partly because it takes more work to design a machine that will work well in an enclosed space. The best price for an integrated washing machine will depend on what you need. Like most appliances, the more you pay, the more fancy features you get. If you’re on a strict budget, then you'll get more bang for your buck (features, programs, spin speeds) by opting for a cheaper freestanding model instead. 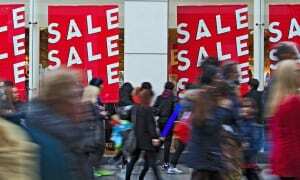 But you can still bag a bargain. We have Best Buy integrated models for around £300. Price can play a big part in picking the perfect washing machine. If you’re on a budget, our top five cheap washing machines will reveal great models that don’t cost a fortune. Our research shows that the average scores for cleaning quality and rinsing for integrated and freestanding versions are on par. Problems arise in individual models rather than types. Check individual reviews before buying so you're not left with a dud. 23% of our integrated washing machine reviews at the time of writing are Best Buys, compared to 27% for freestanding models. How noisy is an integrated washing machine? Everyone wants a quiet integrated washing machine. But the truth is, all washing machines will create a little noise. Integrated models don’t have side panels because they are supported by the kitchen unit, which means they can be subject to more vibrations. To combat this, most integrated models have slower spin speeds. The door cover can slightly muffle these sounds. But if your integrated model is causing lots of vibrations, it could be down to a faulty installation. If there is too much room for movement, the hinges are loose or the surface below is unlevelled than the machine will create more noise. Our washing machine reviews include a star rating for noise. Five stars reflect an extremely quiet model, while one is given to the noisiest machines we test. One of the integrated machines we reviewed scored a measly two stars for noise – which would suggest avoiding watching the TV or listening to the radio while you're washing your sheets. Do you think your washing machine is excessively loud? We explain how to fix a noisy washing machine by following these easy steps. General maintenance, such as cleaning the detergent drawer and the drum, is just as simple with an integrated as it is with a freestanding. It's the repairs that can be troublesome. The pump is located at the bottom behind the kitchen unit plinth making access difficult, especially if the plinth is stuck in place. And when you need to get to the back of the machine, both the door and the machine has to be removed. It would be wise to buy a spare unit door when you install your machine. That way, if you need to replace it after repairs or if the hinges become worn, you'll have a door that matches your kitchen to hand. Can I replace an integrated washing machine? Replacing an old integrated washing machine with a new one in the same kitchen is possible. However, unless you're willing to rework the kitchen units, you'll need to find a model of the same size. Always try to salvage the door or you'll need to find an identical replacement. If you’ve opted for a semi-integrated machine it can be even trickier. Finding a model with exactly the same panel display size would be tough, so buying a new unit cover and completely refitting would be the only way around it. Never try to fit a freestanding model into your units either. The front won't be made to support a cupboard door and screwing holes into it may damage the machine. If you move house regularly, then freestanding machines are the better option. They are easier to remove, transport and refit. If you haven’t got time to weigh up the pros and cons of every model available, we’ve pulled out our top five Best Buy washing machines from our tests. Our washing machine tests are now tougher than ever, which means you can trust that a Best Buy machine is going to be capable of washing your clothes well, while being super simple to use. 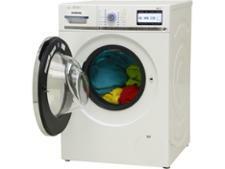 We’ve reviewed integrated washing machines from big names brands such as Beko, Bosch, Ikea and Siemens, plus many more. Starting with the basics, we challenge each machine to clean a range of tough stains, including blood, oil and rust, so we can reveal the models most likely to clean your clothes easily. We also investigate how much it will cost you to run and whether it makes a racket when it’s on. And because no one likes to be left with completely sodden clothes after a spin, our experts also check how dry garments after every cycle. Find out more about Which? tests washing machines to recommend the best models, and warn you about the worst.